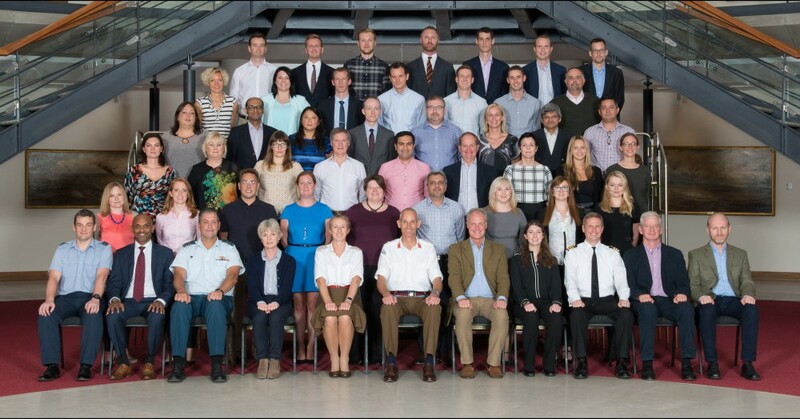 We run joint programmes with the Defence Academy to enable teams and individuals from across the health and care community to participate in Defence leadership and management courses whilst providing them with a unique opportunity to further develop their own leadership skills. Showcasing command and leadership at its best, the Defence Academy of the United Kingdom trains and develops the future commanders of the UK Armed Forces and Civil Service, as well as selected global leaders. This is achieved by drawing on the UK Armed Forces’ leadership principles of trust and empowerment and through exploiting military and science innovation. Our courses are tailored to deliver both the tactical, operational and strategic skills that keep the UK at the forefront of global events and able to respond to the challenges of an increasingly uncertain world. We offer a diverse spectrum of courses from one-day sessions in stress and resilience management, to year-long post-graduate courses on international strategy and leadership, through to professional project management qualifications. The Joint Services Command and Staff College (JSCSC) has offered The Staff College: Leadership in Healthcare (SC) places for healthcare professionals on the Command, Leadership and Management (CLM) Forum element of the Advanced Command and Staff Course (ACSC). The purpose behind this initiative is to provide healthcare professionals the opportunity to experience Defence’s approach to leadership development whilst further developing their own leadership skills. The 5 day leadership and management development programme is delivered as part of a year-long professional development course for middle ranking (Lieutenant Colonel and equivalent) military officers. To inspire and challenge you to reflect on your own leadership qualities and style. The programme is structured around central lectures to the complete cohort, facilitated discussion in health syndicates, facilitated exercises to support self-awareness raising, and time to work on a specific ‘wicked’ issue, nominated by a syndicate’s sponsor and with the aim of providing the opportunity to work on a live issue as a way of learning about the process for approaching such issues in the future. •	Critically analyse leadership and management concepts. •	Understand your personal leadership context and challenges within the healthcare system. •	Assess the value and application of self-awareness. •	Become aware of personal values, principles and assumptions. •	Reflect on techniques for enhancing leadership and management abilities. •	Analyse the features and impacts of negative or poor leadership. •	Gain awareness of how personal traits can influence performance of self and team. •	Analyse resilience and leadership following crises. Read the independent evaluation report of our first joint course in September 2016 by Dr Jaason Geerts, Senior Researcher at Cambridge University. It was a privilege to be included in the programme last week and I am extremely grateful for the opportunity to receive the coaching/teaching/training delivered as it was such a high quality. I feel that I can take forward what I have learned into my practice and the service that I am responsible for will show a tangible improvement as a result. This can only lead to improvements in patient care which is what it was all about. In short, thank you. The biggest outcome I have gained is exactly how you put it – how I see myself in my role. I am continually reflecting on outcomes and how people deserve to be treated and led (as well as a fair amount of following). I simply can not thank you or Staff College enough, truly inspired.